Ready to use black paint in your home decor? Learn how to pick the best black paint for your home. I really love black in home decor. It’s the perfect neutral. 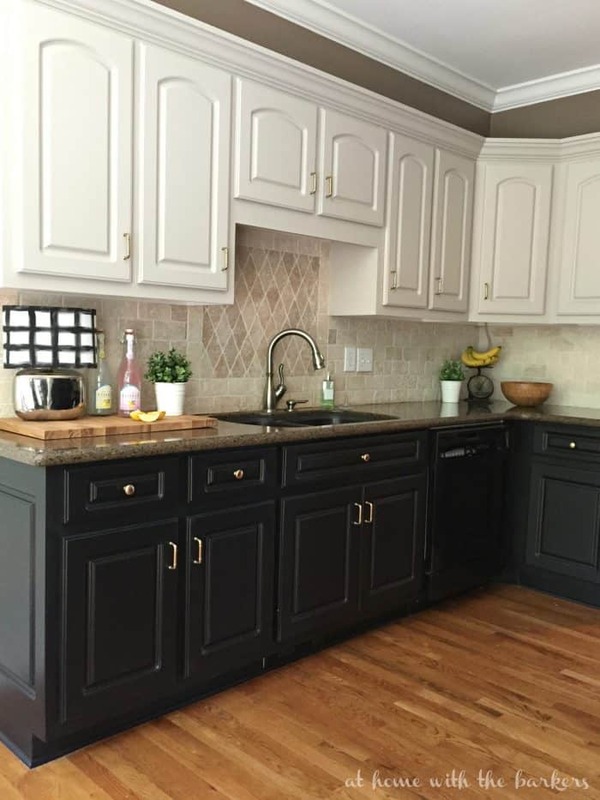 After painting my lower kitchen cabinets black almost 2 years ago I know how hard it is to choose the best black paint colors. Especially after I shared with you all the ugly truth about my black cabinets. Making sure to choose the best black paint color for your home will be a step in the right direction to making sure you love it. I thought I would share with you what I have learned through trial and error. Plus a few of my favorite blacks. Don’t let the word black fool you. There are so many shades of black and the undertone in each particular color can totally change a room. The very best way to see undertones are to sample the paint in the room you will use it. This will give you the best look. Light will be the determining factor in the undertone that you see most. Daylight, nighttime and lamps all play a part in this as well. 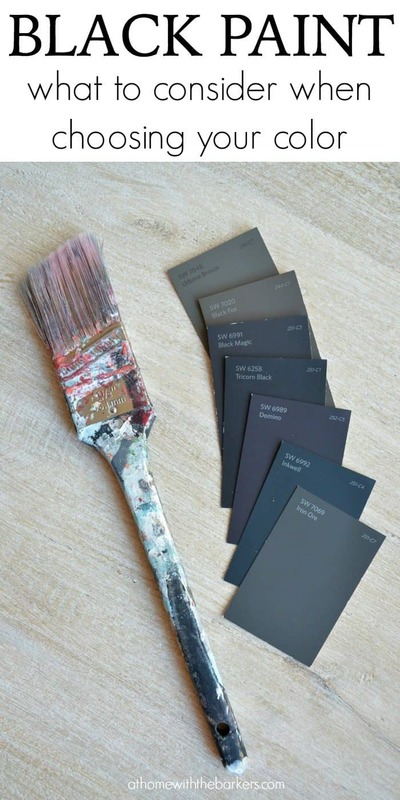 If you grab paint swatches of blacks that catch your eye and lay them out together, you will start to see undertones of the paint. Some will look more brown while others more blue and gray. 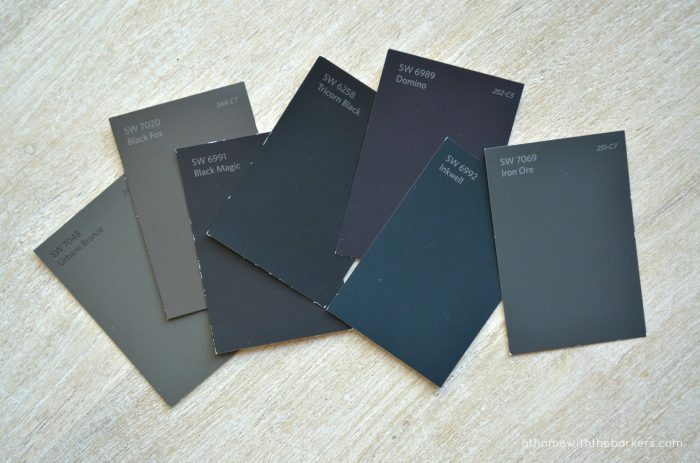 This will help you choose which black you would like to sample in your home. Whether you want to go bold or subtle with black paint there are so many options to add it to your space. Walls, ceilings, trim, furniture and accessories are all possible where black paint is concerned. Black can make a room look too dark or even smaller and closed in. Sometimes that is the look a homeowner is going for but be careful if you don’t like moody spaces. 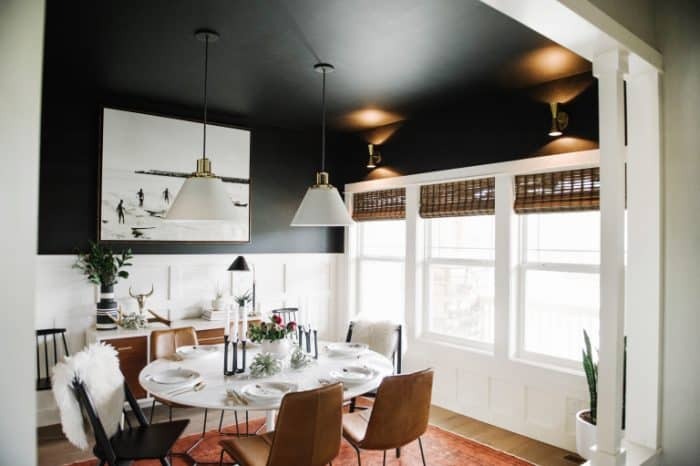 Here are some beautiful inspiration rooms with black paint done right! 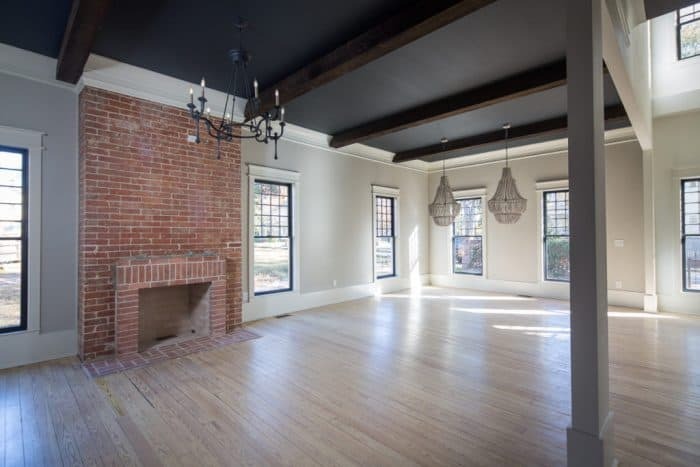 Brittany from Addison’s Wonderland has done amazing things with this historic home. I am in love with those black ceilings. This is a bold move but this large space can handle it. The light walls and floors are the perfect balance. 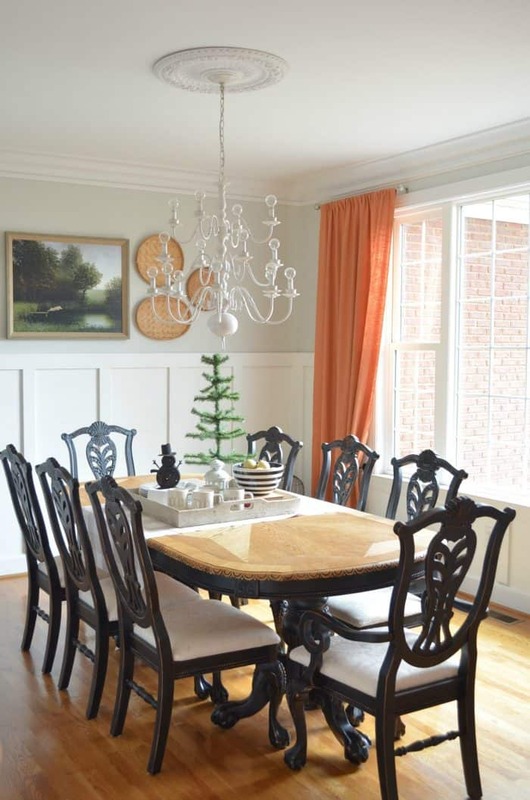 Another example of going bold from the Suburban B’s one room challenge makeover. The warm color on the chairs and rug work beautifully with the cool black. My dining room table was once warm stained wood until I spray painted it black. Then I decided I wanted it two toned and I striped that black paint off the top. The black on this table anchors the room. 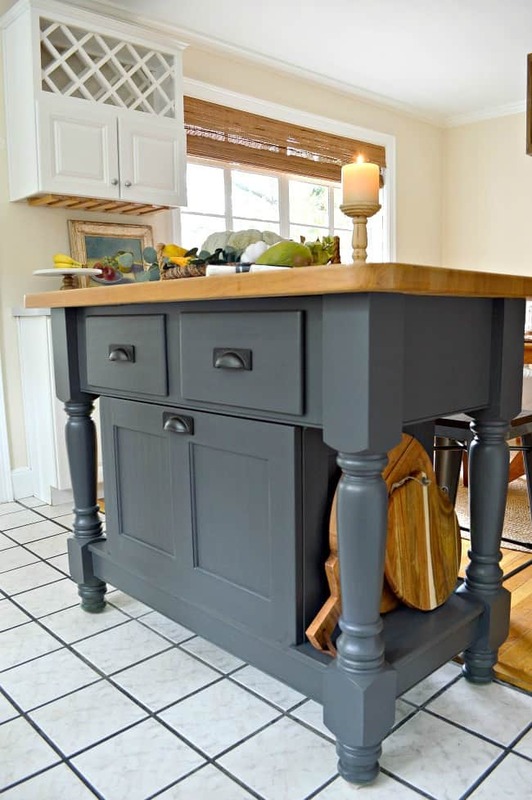 Kristi painted her kitchen island and I love it. It looks classic and makes a nice statement in her otherwise white kitchen. You can see it before on her blog Chatfield Court. When I told you all about the mistake of painting my lower cabinets black many of you chimed in saying how much you loved them. I still love black cabinets when I see them in photos. The black in my kitchen turned out to be the wrong choice. If you don’t like it, you can change it! Just keep in mind, painting over black paint with a lighter color will take more work. You will more than likely need to prime first then paint it a few coats of the new color just to hide the black. I personally never shy away from trying a color for that reason. Paint is one of the cheaper things you can do to completely change a room. My kitchen makeover with black is the prime example. I lived with my black lower cabinets for a while but decided they were not for me. Hope these tips will help guide you in planning your next paint project. I love the black cabinets! Its amazing how many different shades of black there are. The undertones make a huge difference in how it will look in your room. Loved this post. I love your black kitchen cabinets! I’m sorry you aren’t! But you have to be happy. Thank you for sharing all of these great ideas! It is so true that black is not just black! Great information! Thanks for sharing! I’m obsessed with the idea of a black ceiling! Thanks for the tips – it’s tough to choose a great black paint. I don’t think I’d be brave enough to paint a room black, but it looks so beautiful! I LOOOOVE my two tone cabinets and it has been a year!! You do have a lot going on in a small area with all the different tones. I wonder if had you either chose a color in the tiles to paint cabinets or stuck with a tile that is simpler it may have sat better with you. I love all that you do, and I cannot wait to see what you do next to them. The most important thing in decorating is that YOU LOVE it!!!! GOOD LUCK!!! Here is mine : Black and BM Timid white! It’s funny because when I see two tone cabinets in photos, I love them. Yours look great. I have had the tile for about 10 years so I just painted around it because it is still really nice but you’re right, it was just too much going on.